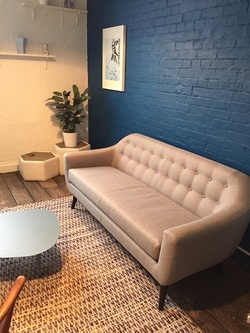 The Couch offers the highest quality psychological therapy and counselling from experienced fully accredited clinical psychologists and psychotherapists. We provide evidenced based interventions to individuals, couples, young people and families of all ages and all backgrounds. We help people to explore the most sensitive of issues in the safety and security of a compassionate, comfortable and confidential space. At The Couch we can help with the full range of psychological problems, including anxiety, relationship problems, stress, depression, anger, sexual issues, eating disorders, OCD, phobias, PTSD, trauma, abuse, self-esteem, work/career, alcoholism, drug addiction, sexual addiction, emotional crises, and bereavements. We also offer psychological interventions that go beyond working with distress to promote positive psychology by building emotional resilience, improving self-esteem, encouraging self-awareness and building confidence. There are many different psychological therapies including cognitive, behavioural, psychodynamic psychotherapy, analytic and systemic. We offer a range of therapies tailored to meet your individual requirements. Therapy developed to relieve distress from psychological problems such as depression and anxiety though its use is not restricted to working with mental health problems. It can also help people learn more about themselves, improve relationships, assist in personal development and increase personal awareness. An overview of recommended evidence based interventions for various disorders can be found at the National Institute for Health and Care Excellence. Hi, my name's Luke and I'm a Doctor of clinical psychology. I set up The Couch after struggling to find consultation rooms which I felt were therapeutic and comfortable enough for my clients. Instead of continuing to struggle in my search I decided it would be more beneficial to find a room where I could personally create the safe and comfortable space my clients deserved. The vision has been realised in our space at the Bussey Building, an iconic building and community in London's borough of Southwark. 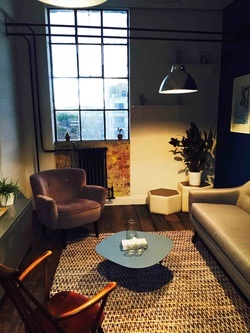 The Couch is next door to Peckham Rye station and easily accessible on the overground or mainline trains from Clapham, Shoredicth, London Bridge and Victoria. BA (Hons), PhD, DClinPsy, MBPsS, CPsychol. Clinical psychologists are always trained to doctoral level and it is a legal requirement that they register with the Health and Care Professions Council. The title of clinical psychologist is protected by law which helps people stay safe from unqualified and potentially harmful practitioners. The titles counsellor and psychotherapist are not protected by law and can be used by people with limited or no qualifications, training and experience. Consequently, finding appropriately qualified and experienced clinicians can be tricky if you're not sure what to look out for. We put together some advice on ﻿how to find a psychotherapist﻿ below to help you in your search. Clinical psychologists are leaders in the provision of psychological therapy within the NHS and they often supervise and oversee the work of other psychotherapists. We aim to have practitioners from various psychotherapeutic backgrounds including CBT therapists, counselling psychologists and psychodynamic psychotherapists. Rest assured all of our practitioners' credentials are carefully checked to ensure they meet with our high standards. Clinical psychology is an integration of psychological science, theory and clinical knowledge for the purpose of understanding, preventing and relieving psychological distress whilst promoting well-being and assisting personal development. Clinical psychologists are at the forefront of the delivery of psychological therapy within the NHS and they are trained to the highest doctoral level. The skills and knowledge of clinical psychologists are held in the highest regard. Clinical psychologists are specialists in delivering evidence based psychological therapy. Formulations developed during assessment guide our decisions as to whether a psychological therapy will be of benefit. Assessment takes on average two sessions and will determine the length and type of intervention required. This could be as short as six to eight sessions or for longer periods of 1 or 2 years depending each persons needs. Our therapists are registered with a number of private health care insurers. It used to be the case that if you wished to use health insurance for therapy sessions you would need to be referred by a psychiatrist. However, most insurers are now happy for you to approach us directly. Your insurance provider may request that you see your GP before coming to us, but this relatively straightforward and easy. We would recommend that you give your insurer a call first to discuss with them their requirements before you contact us. Some providers will cover clients for a certain number of sessions, while others will allocate a lump sum. If you are approaching the limit of your current cover it may be possible to obtain a re-authorisation. If you would like to do this it’s important to discuss this with your insurer well in advance, as the process can take a number of days and may result in a disruptive break in your therapy. I have often been asked how someone might go about finding a psychotherapist / psychological therapist. Unfortunately, it's not straight forward so we decided to put this information together to help people in their search for appropriately qualified and able clinicians. None - That's right, some practitioners do not have any appropriate qualifications and therefore no regulatory body. You need to check first. Diploma level (5 levels of varying length) - this is often a route into becoming a psychotherapist / counselor. Diploma levels range from 1-5 with Level 5 is the highest. Level 4 and 5 qualifies for student registration with some accrediting bodies if that course in an accredited course. Undergraduate degree (BSc/BA - 3 years full time) - this is a foundation degree which allows for student registration with an accrediting body if that course in an accredited course. Post Graduate Diploma (PGDip - 2 terms) - Often taken after an undergraduate degree or following on from a diploma (level 4/5). Typically shorter than a Master degree (two-terms / 120 credit). Accredited courses should include supervised client contact. This is the minimum level or training we would expect from a practicing clinician. All courses should be registered with an accrediting body. Therapist are likely limited to one therapy approach. Masters Degree (MSc/MA - 1 year full time) - An MSc/ MA follows on from a undergraduate degree and is often longer than a PGDip. This is the minimum level or training we would expect from a practicing clinician. All course should be registered with an accrediting body (see below). Therapist are likely limited to one therapy approach. Traditionally, part of the problem has been that certain titles are unregulated and anyone is able to use them. For example, anyone can use the title 'counsellor' or 'psychotherapist' without any qualifications. There are a number of regulatory bodies which oversee the work of psychological practitioners / psychotherapists in the UK. You should check whether your therapist is accredited by one of these bodies and their level of training. The HCPC regulate health and care professionals in the UK and were set up to protect the public from unregulated practitioners. They only register professionals who meet their standards for training, professional skills and behaviour. They can take action against health professionals who fall below these standards and can also prosecute those who pretend to be registered. The titles 'Clinical Psychologist' and 'Counselling Psychologist' are protected by law through the HCPC. Clinical psychologist are always trained to doctoral level (DClinPsy) and Counselling psychologists (DPsych). Doctoral level training would indicate a level of skill and knowledge over and above that of post graduate diploma, undergraduate degree (BSc/BA) or a Masters degree (MSc). The BPS is the professional body which provides accreditation for psychology training programmes. The BPS's role is complementary to that of the HCPC. The BPS provides a Directory of Chartered Psychologists. They also provide information to the public and ensure the highest standards of education, training and practice. Chartered status with the BPS is not a requirement for psychologist to practice and all practitioner psychologists must have accreditation with the HCPC. The BABCP is a multi-disciplinary interest group for people involved in the practice and theory of behavioural and cognitive psychotherapy. CBT is recommended as a first line intervention for many mental health problems, particularly common mental health. It is one of the many forms of therapy available and has become prominent as it has a good scientific evidence base whilst also being time limited. The BABCP provides accreditation for CBT therapists and holds a record of trained CBT practitioners. CBT therapists vary in their training and experience. Some may also hold another professional accreditation in mental health nursing and social work. Clinical psychologists often lead on the delivery of CBT within the NHS and some also have BABCP accreditation as an adjunct to their HCPC registration. The BPC is a professional association and voluntary regulator of the psychoanalytic psychotherapy profession, publishing a register of practitioners who are required to follow their ethical code and meet their fitness to practise standards. The BPC is composed of 14 member institutes, and register organisation members as 'BPC registrants' where training has been completed. Training programmes range from certificates, diplomas, advanced diplomas and masters of arts of science. There are currently no doctoral level training programmes. You can check registered practitioners individual training and the organisation they trained at the BPC website. The degree of skills and knowledge will vary between individuals. The UKCP is the professional body for the education, training and accreditation of psychotherapists and psychotherapeutic counsellors. Their membership includes over 7,800 individual therapists and more than 70 training and accrediting organisations. Training ranges from certificates, diplomas, advanced diplomas and masters of arts of science. There are currently no doctoral level training programmes. You will need to check with the individual member organisations about the level of training required for practitioners to register as this will vary between organisations.